This system was built in 1978 to replace an Altair, using some of it's existing components, two of it's advantages being that it had a larger power supply as well as room internally for a 5-1/4" disk drive. 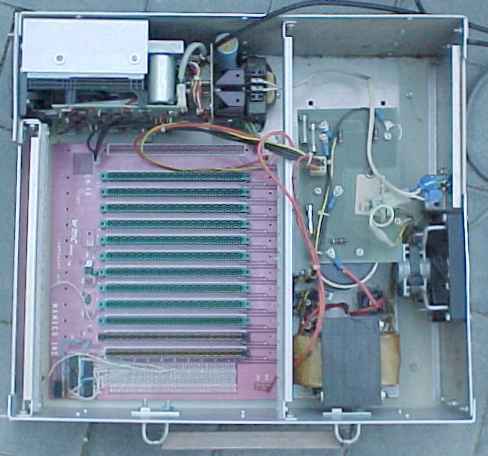 As originally built, it had an 8080 CPU, a Solid State Music VB1 video interface board, and a homebuilt parallel keyboard interface built using plans from a magazine article. Later, the 8080 CPU was replaced with the Z80, which included a 1k ROM monitor program and built-in serial and parallel ports. This negated the need for the keyboard interface and video board and a serial terminal was then used for console I/O. The system also contained up to 40k of RAM, the mainboard has 12 S-100 bus slots, and it boots North Star DOS and BASIC from it's hard sectored disk system. Shortly after being upgraded to the Z80 CPU, the system was replaced with an Osborne 1 and retired. The 1k ROM monitor program was written by the original builder of this machine, as was the software used to interface the VB1 video interface with a SWTP KBD5 keyboard, ProTech 3P+S IO board, and the North Star mini floppy in an Altair 8800. I have all the original documentation for the components, with the exception of the Z80 CPU board. I do have the documentation for the SBC-880 Z80 cpu board though. I also have a Processor Tech. 4KRA 4k RAM board and PMMI MM-103 modem that I may install in this system. 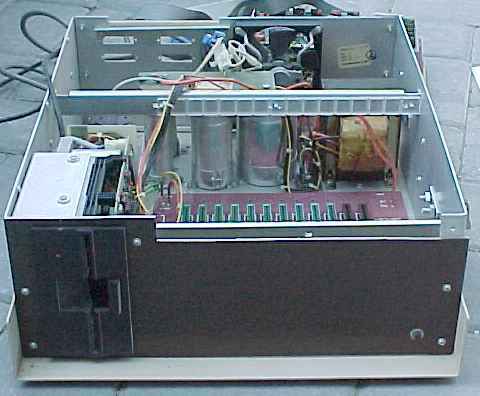 The powerboard provided with the North Star Micro-Disk System is bolted directly to the rear of the Shugart floppy drive, providing power to the drive directly from the A/C input coming into the chasis and not from the system power supply. The North Star floppy is a 35 track SSSD format of ~87k capacity (256byte blocks, 35 tracks @ 10 sectors/track) on hard sectored diskettes. Later North Star disk systems increased this to double density using the MDS-AD controller. There is also a homegrown circuit on the QM-1A backplane which is connected to a reset switch on the front of the chasis which allows the selection of the 8k memory boundry to be executed upon issue of a RESET.